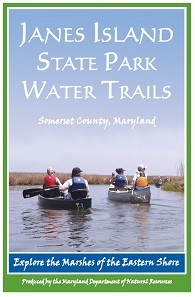 The Janes Island State Park Water Trail map/guide features seven water trails, all of which begin and end at the Janes Island State Park Marina and boat launch. The trails provide a wide variety of paddling experiences so there are options for all levels of expertise. The map/guide also includes information on park amenities, camping, boating safety and regulations and the area’s natural resources. The trails range in length from 1.25 to 12.5 miles and include routes along the open waters of Tangier Sound, the Big and Little Annemessex Rivers as well as various creeks and marsh routes.